This #SundaySupper is all about being thankful and the recipes that are associated with Thanksgiving and Hanukkah. As you can tell from my photo, I messed up on that last part. Who puts a cheeseburger on a Thanksgiving table anyway?!? Whoops! 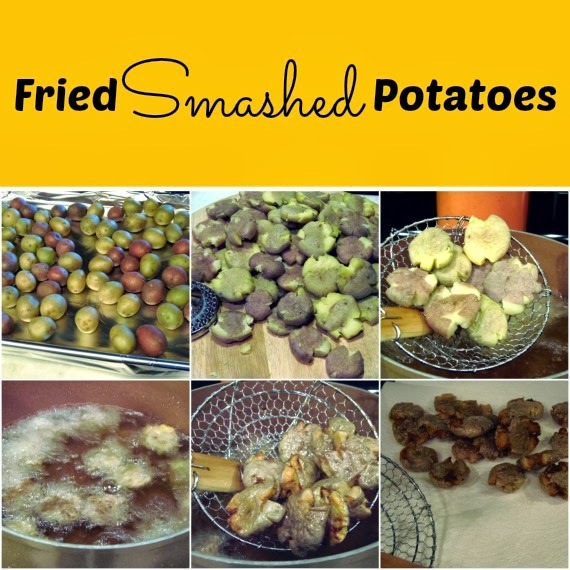 I’m not sure who would actually serve Fried Smashed Potatoes on Thanksgiving either, but you certainly could! They definitely have a taste to be thankful for! That’s what I’m talkin’ about!!! Getting back into the reason for the season…Being Thankful. I am thankful for so, so many things in my life. First and foremost, I am thankful for my loving husband and our two grown sons. I love them more than I can say, even though we struggle at times with trying to understand each other and our communication becomes difficult and uncomfortable. Having said that, I could not imagine my life without them in it, and I know that, when push comes to shove, we each have the others backs, and would do anything to protect one another. Love. I am thankful for their love and I return it to them from the bottom of my heart! Speaking of love, I’m so thankful for my love of cooking. It is because of this love that I have my blog and through my blog have become acquainted with so many other wonderful food bloggers who have welcomed me so warmly into the food blogging community. I am so thankful and feel so blessed for that! Naturally I’m also thankful for our good healthy, our extended families, our home, our pets, our wonderful friends, the country we live in, our freedoms, the clothes on our back and, of course, the food on our table. -Place the potatoes on a baking sheet and bake for approximately 45 minutes or until the potatoes are fork tender. -Remove them from the oven and allow them to cool completely. -Using a meat mallet (rolling pin, or even the bottom of a can), smash and flatten each potato. -In a large pot, over medium high heat, heat the oil to 360-375 degrees. -Using a large slotted spoon, carefully lower some of the smashed potatoes into the oil and allow them to fry until they become a lovely golden brown, turning them occasionally. 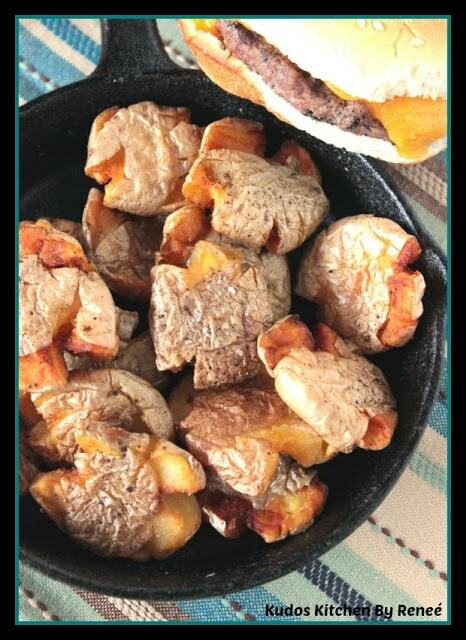 -Remove the fried potatoes to a paper towel lined bowl and immediately season them with salt and pepper. -Continue frying the remainder of the potatoes in batches. For more reasons and recipes to be Thankful for this #SundaySupper, check out all the other wonderful contributor’s blogs and their posts on #BeingThankful #Thanksgiving and #Hanukkah! I’d also like to give a big shout out to our host for this week’s #SundaySupper…Paula of Vintage Kitchen Notes! Thank YOU, Paula! Oh my goodness these look so much fun. I bet my two year old would have a lot of fun "helping" to smash the potatoes. What a great job for a little helper. I'm sure your two year old would have such fun being the smasher! Thank you Paula. I've met so many wonderful friends through food. It truly feeds the soul. Thank you very much. I don't recommend eating them this way all the time, but for a spurge, they're pretty fantastic! 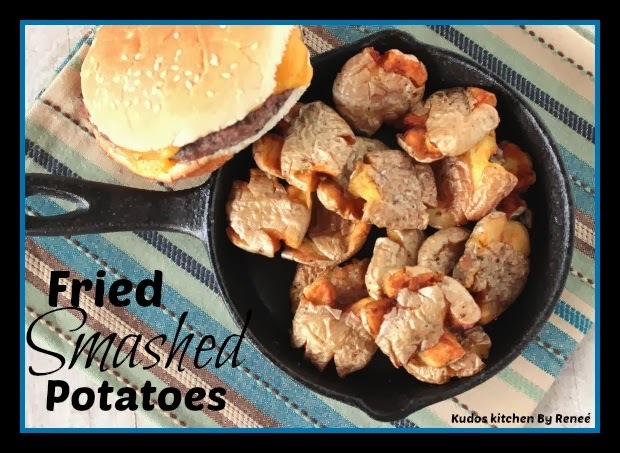 I could eat smashed taters every day of the year! Yummy on those potatoes and I could eat them anytime, but I do save them for special occasions for sure. Thanks for sharing!!! These sound like a crazy-delicious cousin to the french fry! Lovely post Renee and those fried smashed pototoes look scrumptious. Wishing you a wonderful Thanksgiving and may your table be blessed with great food enjoyed by family and friends. Wow, what a crazy recipe, crazy delicious recipe! I could sooooooooooo eat all of those potatoes! What a great idea!! Love your recipe. I'm gonna try this! The only thing missing was the pretzel bun 🙂 Might have to make pretzel bun croutons to top it next time….Mmmmmm. We love soup too Stephanie! It's the perfect meal on cold winter nights. I hope you'll enjoy this one. Thank you Martin! I hope you will and come back to let me know what you think. LOL. I love that you called it a crazy recipe. I could not agree more. Crazy good! Thank you so much Paula! I am thankful for friends like YOU! What a great recipe!!! Just fantastic – we will love it 🙂 Happy Thanksgiving to you and yours. My family would love your potatoes! Even on Thanksgiving!!! Have a great one, Reneé! Fried Smashed potatoes!!! I love this! totally going to give this a try. . hope you and your family have a wonderful Thanksgiving! !